It worked, all right. The next morning, when I walked into the kitchen, this is what I saw: The bowl was nearly empty. A lava flow of green pancake batter had oozed over the rim, streamed to the edge of the counter, and cascaded down to spread across the floor. Whatever was I going to do? The kitchen smelled wonderfully of cinnamon and yeast, but it was a mess. I didn’t have enough flour and eggs to start over. And a dozen hungry people were showing up in half an hour, expecting pancakes. Then I noticed something. In the warm spot over by the furnace vent, the edge of the pancake puddle was dry, with popped bubbles on top—just the way a pancake should look when the underside is perfectly cooked and it’s ready to flip. This gave me an idea. Why not cook the batter right where it was? It was spread out at just the right thickness. The floor, having been scrubbed only a week ago, was perfectly clean—well, clean enough. All I needed was a heat source. My first thought was the hair dryer. No, not hot enough. The iron? Closer, but still not hot enough, even set on “cotton.” I needed to do this fast, and I needed to do it right. I went out to the garage and got the blowtorch. My insurance agent would have had a hissy fit, but what she didn’t know wouldn’t hurt her. Besides, I happen to know that a blowtorch, properly employed, is a precision implement. I’ve seen my son-in-law use one to burn the peeling paint off the deck without charring the wood, etch a child’s initials into a 2 x 4, and delicately incinerate individual thistles. True, I’d never done any of these things myself, but if a son-in-law could do it, how hard could it be? I put on my safety goggles, slipped on a pair of oven mitts, and set to work. Half an hour later my guests burst through the door, to be greeted by the appetizing aromas of cinnamon, freshly-baked pancakes, and warm chokecherry syrup, with the merest subtle undertone of propane. The blowtorch was back in the garage where it belonged. The kitchen was, if not perfectly pristine, pretty much as clean as usual. The few insignificant little scorch marks on the cupboards were hardly noticeable at all. That one little spot where the vinyl flooring had melted a teeny, tiny bit was in an inconspicuous corner. 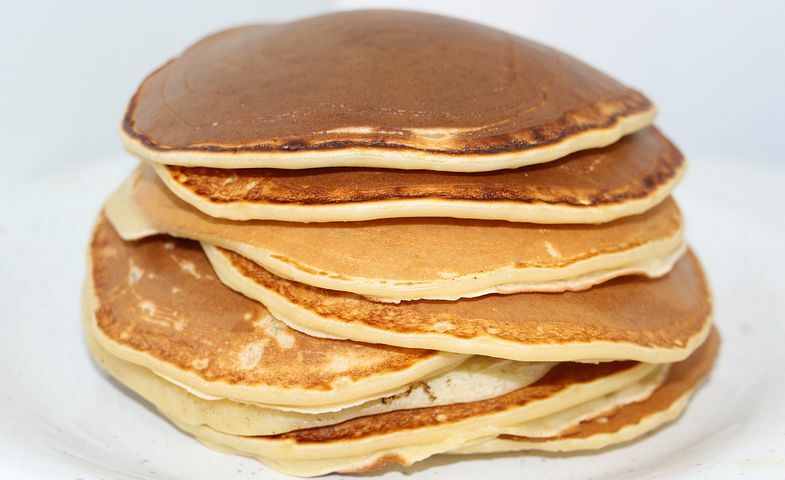 On the table were two tall stacks of green pancakes. They may have been a little browner than usual—not necessarily a bad thing, since it served to disguise any odd bits of extra ingredients they might have picked up from the floor. They were not, however, shamrock-shaped. When you’re in the kitchen and in a hurry, there are limits to just how precise you can be with a blowtorch. Dear Kathleen, what a hoot! You made me laugh out loud. Thank you! Thank you–and I assume you believed every word . . . So funny but another example of your fertile mind and great writing skill, Kathleen. Thank you for being too polite to mention that bovine substance that gardeners and farmers use to increase fertility! All good true stories have a little exaggeration in the telling. Just what is a ‘little’ is up to the person who is doing the telling. Very true. Levels of exaggeration are up to the teller, and levels of belief are up to the readers.